SpaceX’s Falcon Heavy rocket successfully lifted off Thursday, marking the towering booster’s second flight and its first commercial launch. This was also the first time that all three of the rocket's reusable boosters returned safely to Earth. Less than 10 minutes after liftoff, the rocket’s two side boosters maneuvered back to Earth and nailed simultaneous, side-by-side landings on pads at the Cape Canaveral Air Force Station. For the first time, the company also successfully landed the center core booster on a robotic drone ship in the Atlantic Ocean, off the coast of Florida. Flight engineers at SpaceX's mission control center in Hawthorne, California, erupted in loud cheers after it was confirmed that all three boosters returned safely. "The Falcons have landed," SpaceX CEO Elon Musk tweeted. The Falcon Heavy is designed to loft into low-Earth orbit up to 140,000 pounds — more than any American rocket has been able to carry since NASA’s Saturn V, which took Apollo astronauts to the moon in the 1960s and ‘70s. 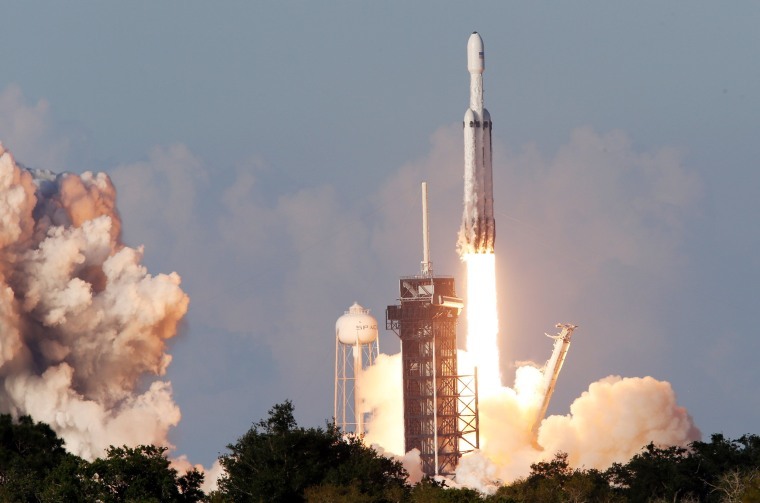 The Falcon Heavy made its maiden flight on Feb. 6, 2018.